With Valentine's Day coming up very quickly, it's probably time to start thinking about what you're going to gift your pets. 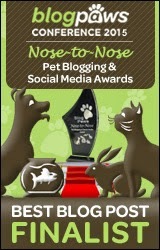 It could be toys, treats, or general pet care products that you can put to good use. 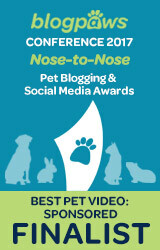 To give you some Valentine's Day gift ideas for your pet, we have partnered with Babble Boxx. Babble Boxx offered to send us a surprise care package for Valentine's Day. Babble Boxx is not a subscription box company, but rather a special box that is delivered to social media influencers. Inside our box, we found several items from Hartz® for both cats and dogs. 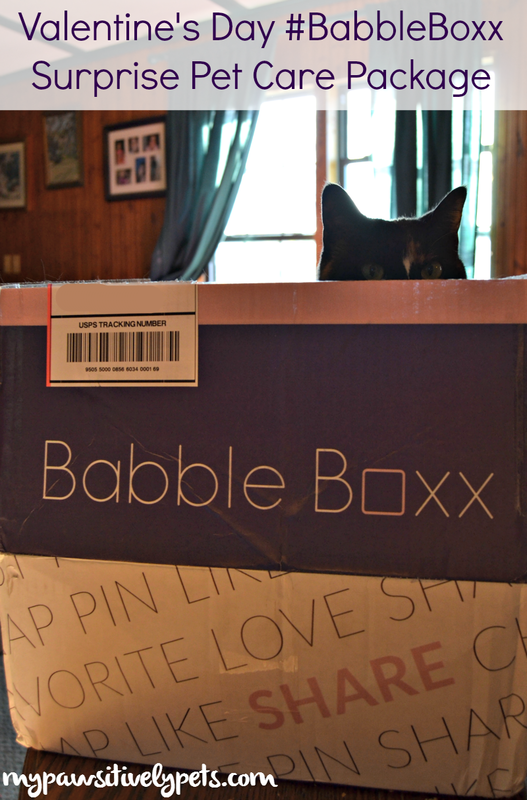 First things first, Callie claimed the Babble Boxx for herself. She loves the nesting paper and this is her new favorite bed. After I coaxed Callie from her nap in the box, it was time to play. Here's a look at our surprise care package items. 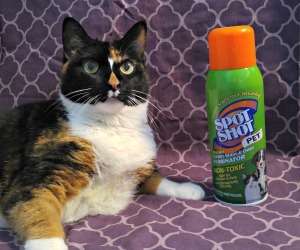 This is an interactive cat toy that has proven to be a lot of fun for Callie. The mouse cat toy on the end of the wand is filled with catnip for even more fun. There are also plenty of feathers, which seem to add a nice touch to the toy. Callie loves playing with toys like these. She's been playing with it daily and having a good time. Every time I go to the grocery store and stop by the pet section, I see many fun Hartz cat toys on the shelves. However, this is Callie's first cat toy from Hartz. This wand toy is probably our favorite item that came in the care package. 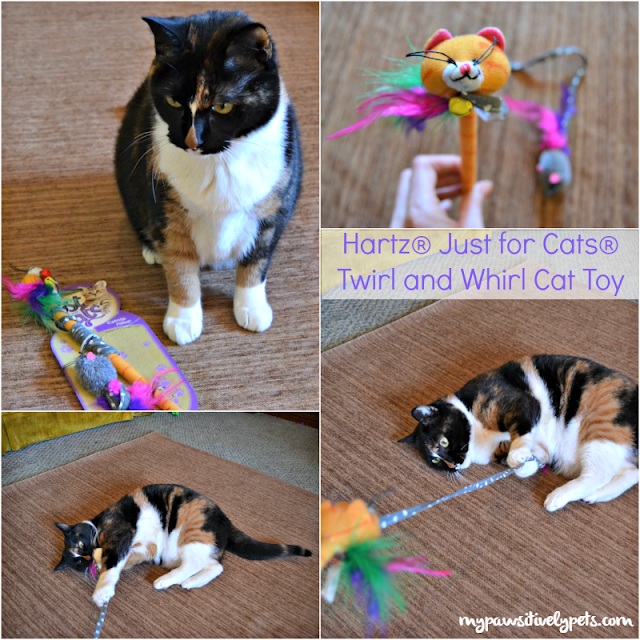 You can watch Callie play with the Hartz® Just for Cats® Twirl and Whirl Cat Toy in the short video below. This dog toy is very soft and flexible. Shiner being the heavy chewer that she is, I did not think this dog toy would stand a chance against her honestly. However, it's still alive after several days so it passes the durability test. 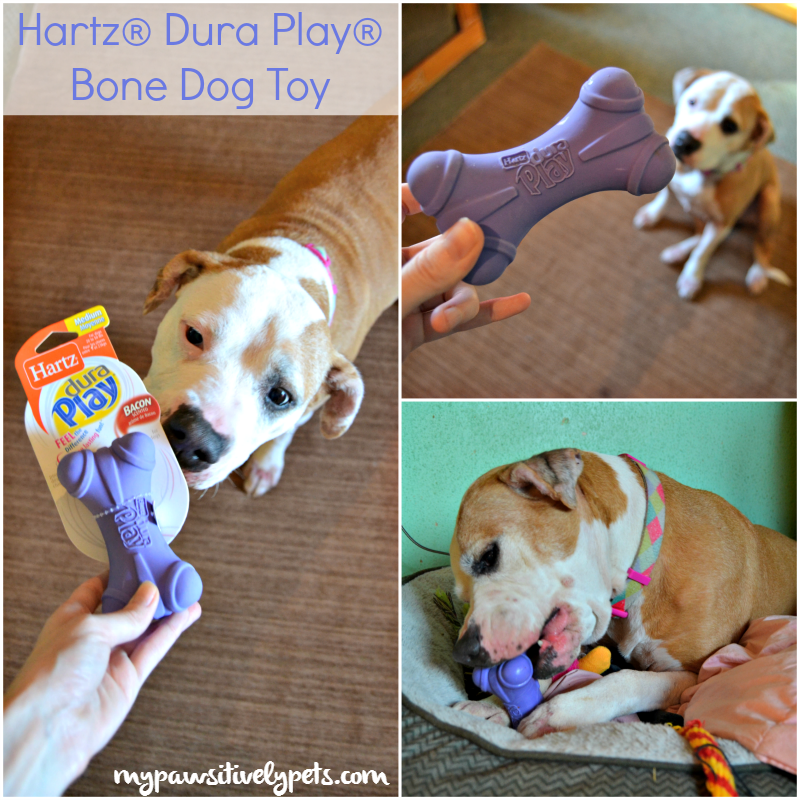 The Hartz® Dura Play® Bone Dog Toy is bacon scented and squeaks, making it extra fun for dogs to play with. It's a good toy for dogs of all ages from puppies to senior dogs, like Shiner. 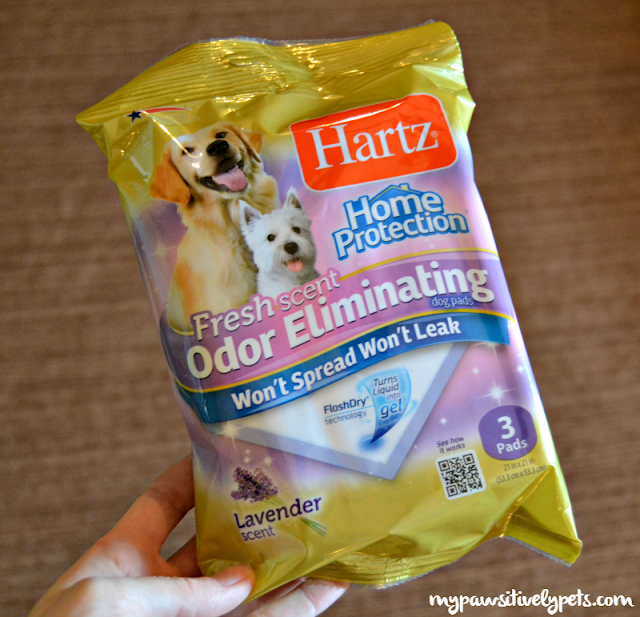 Perfect for families with puppies who are potty training, Hartz® Home Protection™ Odor Eliminating Dog Pads are absorbent and won't leak or spread. The pads eliminate odors and have a lavender scent. They are made with Flash-Dry® technology that turns liquid into a gel. There are directions on how to teach your dog to use these pads on the back of the package. This would make a nice care package gift for new puppy parents. While most dog pads are generally used to potty train puppies, I actually think these could be useful for older dogs as well. Especially ones who may have urinary incontinence and may occasionally wet their bedding. 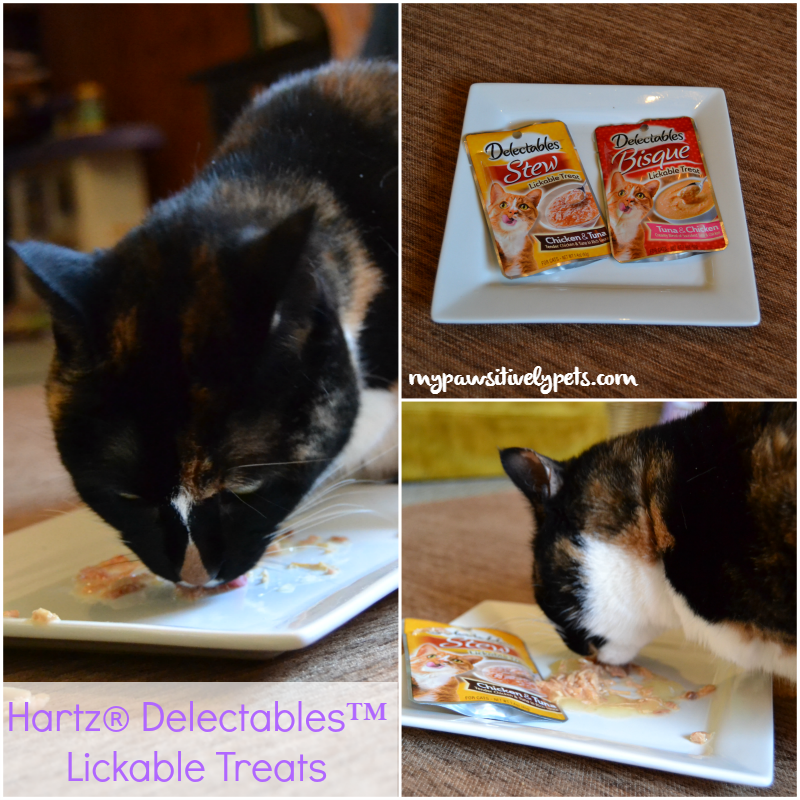 We received two flavors of Hartz ®Delectables™ Lickable Treats - Stew and Bisque. These treats come in a small pouch and are a small portion of wet, lickable cat treat. They are a combination of tuna, chicken, or seafood in a rich sauce. After our play session with the cat toy, Callie was ready for a snack. She loves wet food, and she happily licked up her Hartz Delectables Lickable Treat. Remember that these are meant as treats and not as a meal or complete diet. One of the nice things about all of the Hartz products in our surprise care package for pets is that they are all affordable. This means your pet can experience a little bit of everything from pet toy fun to tasty treats. You can find special offers and printable coupons from Hartz on their website here. Wait, we're supposed to get gifts on Valentines Day? I thought it was just a day for my human to get chocolate and get taken out to dinner! I get the feeling we kitties here have been ripped off. That is a nice gift box. That's nice they have a box for dogs and cats. That's a nifty box - never heard of it. Looks like your crew scored big for Valentines Day. Whoa! Nice stuff in there. Callie is a lazy player, isn't she? I would be jumping all over the place *whiskers* for about 3 minutes. This is my first time hearing of Babblebox - looks pretty cool! So funny that Callie had to check out the box first. Cat's just can't help it! Our kitties would definitely go crazy for that Twirl and Whirl!